Happiness, what does this word ring in your mind? It will be a car, a person, money etc. Everything material, isn’t it? Hold on to that thought. Our previous LogicTalks had various industry stalwarts speaking about passion, ideas, execution, being a go-getter etc. So this time, it was all about something that is an indispensible part of our lives. Something we live for and always hope to be. LogiMates too contemplated on what the topic of happiness will cover. 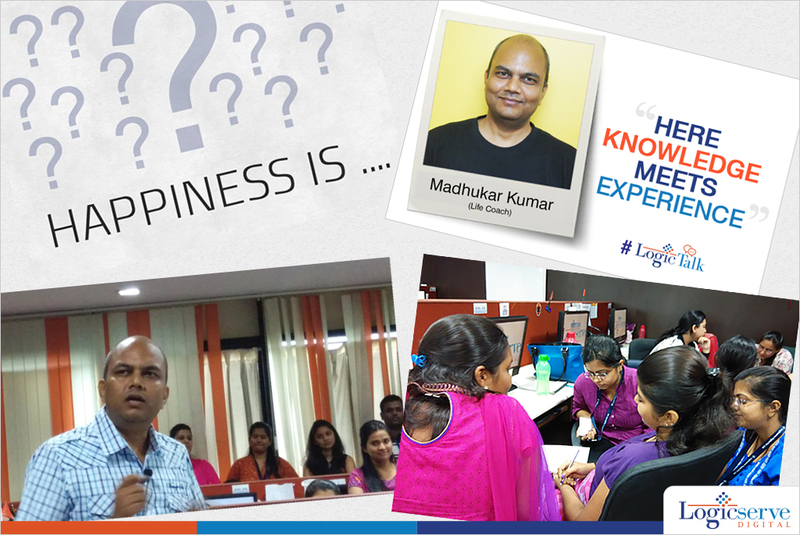 Will Madhukar (Life Coach) talk something about happiness that we already don’t know? Buying a car, house, favourite watch, taking their parents /loved ones out on a holiday, ornaments, travel etc. Then followed silence, and promptly Madhukar said, “Each one of you is connecting happiness to success. Success and happiness are two different entities.” For me, this realisation converted the entire room into a beautiful coke studio song like Zariya, unfolding at various stages, with a new metaphor conveying a new meaning. Everyone agreed in unison about this attitude. It felt the world went back to referring time using the sun, to the age of Khalil Gibran rather than digital watches. Every thought took us back to our fundamentals, making us rethink our perceptions, and the path chosen to move ahead in life. Express Gratitude: The whole idea is to be grateful for everything you have in life. Be grateful to the people who have contributed in your life. Once an individual is grateful for everything that happens to them, they can be happier in general. Passion: This is often undermined or sounds like a jargon to those who haven’t experienced it in their life. One always has to attach self to a goal, a purpose. Once we completely dedicate ourselves to our passion and do what we like, our happiness quotient will increase. Write down your gratitude: One of the best ways to stay happier is to write down every evening what you have been grateful for, through the day. He suggested everyone give themselves a 45 day challenge and start maintaining a dairy. At the end of the session we surely knew what happiness isn’t and may be a little bit of what it is. I have decided to take the challenge and pen down every day the small joys that life gives me. What about you?